One of the strengths of the Euterpea library is the ability to generate complex musical values extremely concisely. Here I’m going to walk through an example of that, the results of which I then took and turned into a more serious composition. 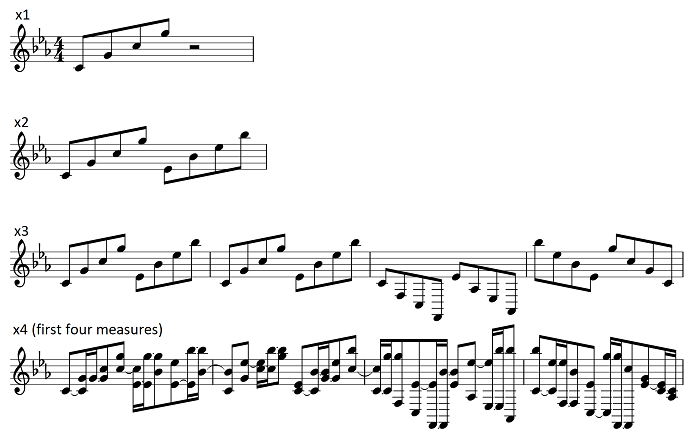 Just four notes – fifths going up an octive. Not too interesting yet. How about some transposition to add new pitch classes into the mix? An interesting thing about patterns based on fifths is that they often behave well when inverted vs. turning into an atonal mess as is the case for more complex melodies. So, why not throw in a bit of that and a retrograde as well to get some variety? , it still sounds boring pretty fast. A common trick to add complexity in algorithmic work is to layer a sequence with itself at a slightly different tempo. When the tempo differences are very small, such as a <1% difference in tempo, it’s called a phase composition and the two patterns slide in and out of synchrony (phase) slowly over time. When the differences are greater, the effect is different and you get interesting textures that can be hard to identify as the same motif. Let’s layer this pattern with itself at 2/3rds its original speed to make it 1.5 times as long. This will add a lot of variation by ensuring that there are no repeats for quite a while.